Indian Railways is set to roll out a major makeover of its AC 3-tier coaches. 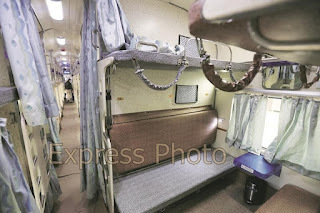 A few changes made to the coaches, which have had the same look and feel for decades, the new-look AC 3-tier coaches would become more comfortable, luxurious and passenger-friendly, according to a report published by The Indian Express. The move follows Prime Minister Narendra Modi's view on the need for modernisation of the railways. He had earlier assured his government's commitment in this regard. The first revamped coach is currently awaiting the railway ministry’s final approval, before it hits the tracks in the new all-AC-3-tier Humsafar Express. There have been at least 10 major and minor design interventions. The AC 3-tier is the only passenger operation in which the Indian Railways makes a profit, the daily reported further. 1- As part of the new look, a beige-cream-grey colour scheme has replaced the old signature blue upholstery of the Railways. 2- In the new coach, a thin, cushioned plank has been placed alongside the side-lower seats. After lowering the backrests, the passenger will have to slide the plank up to place it on top of the joined backrests for it to become a flat berth. 3- The new AC 3-tier coach will have USB charging ports and reading lights for all berths. Ladders with comfortable footrests and additional handles have been included for easier access to the top berth. 4- A GPS-enabled screen has been installed in each coach to display the train’s location. 6- Special capacitors for the ports have been included as people to use their phones while they are being charged and so they don’t heat up. 7- For the toilets, inputs from National Institute of Design have been incorporated. The floor is made of a material which does not soil easily and the walls are graffiti resistant. The steel mug chained to a pipe has been replaced by a faucet. 8- The coaches will have separate urinals for men in the toilets. Foldable nappy-changing tables for babies will also be available. Apart from these features, the new coaches will have other add-ons like CCTV cameras near doors, smoke-detector alarms and tea-coffee vending machines. The manufacturing cost of each coach is Rs 2.7 crore, about Rs 20 lakh more than an ordinary AC 3-tier coach, said the report.